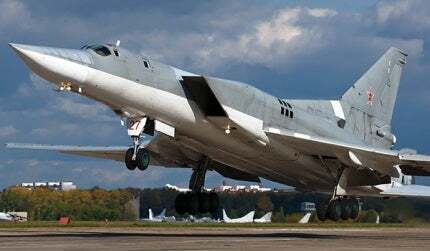 The Tupolev Tu-22M is a long-range strategic and maritime strike bomber of the Russian Federation. Image courtesy of Alex Beltyukov. The Tu-22M aircraft are currently operated by the Russian Air Force and Russian Naval Aviation. Image courtesy of Max071086. A close front view of the Tupolev Tu-22M3 strategic bomber. Image courtesy of VargaA. The Kh-22 anti-ship missile fitted to a Tupolev Tu-22M aircraft. The cockpit of Tupolev Tu-22M3 long-range bomber is equipped with multiple panels. Image courtesy of Vitaly V. Kuzmin. The Tupolev Tu-22M (also known as Backfire) is a long-range strategic and maritime strike bomber developed by Tupolev for the Soviet Air Force. The aircraft is currently in service with the Russian Air Force and Russian Naval Aviation. The Tu-22M was based on the design of the Tu-22 aircraft. The first Tu-22M-0 prototype completed its maiden flight in August 1969. The Tu-22M-1 first flew in July 1971 and the Tu-22M was first deployed in combat missions in Afghanistan between 1987 and 1989. The Tu-22M3 was used by Russia for combat operations in Chechnya in 1995. The aircraft is primarily used to conduct nuclear strike and conventional attack operations. It can also be deployed in anti-ship and maritime reconnaissance missions. "The aircraft is primarily used to conduct nuclear strike and conventional attack operations." The earliest pre-production aircraft produced was the Tu-22M0. Its production was limited to small numbers due to inadequate performance. It was followed by the Tu-22M1 pilot-production aircraft for the Soviet Naval Aviation. Production on the first major production version, Tu-22M2 began in 1972. It was equipped with extended wings and a redesigned fuselage, twin engines and a new undercarriage. The Tu-22M3 was introduced with upgraded features to overcome the shortfalls of its predecessor. The aircraft completed its first flight in June 1977 and was inducted into the inventory in 1983. Some of the Tu-22Ms were also modified to Tu-22MR and Tu-22ME standard. The Tupolev Tu-22M incorporates a long variable sweep wing fuselage design. The aircraft features a stepped cockpit and variable-geometry outer wing panels. The tail fin is swept-back and tapered with a square tip. The flats mounted on the centre of body are pointed with blunt tips and each wing includes a centre section and two outer panels. The outer wings are attached to the centre section through hinged joints. Tu-22M3 has a length of 42.4m, maximum wing span of 34.2m, and a height of 11.05m. The empty weight and maximum takeoff weights of the aircraft are 53,500kg and 126,400kg respectively. The semi-glass cockpit accommodates a crew of four on upward-firing ejection seats. It is equipped with dedicated panels for pilots, navigator-operator and commander, with entry provided through individual doors. The pressurised cockpit is equipped with climate control systems. The aircraft is provided with hard points to carry Kh-22 stand-off missiles, Kh-15 nuclear or Kh-15P anti-radar missiles and FAB-250 or FAB-1500 free fall bombs. The wing and fuselage pylons and internal weapons bay are provided with a capacity to carry 24,000kg of weapons payload. The aircraft is also armed with a double-barrelled GSH-23 (23mm) gun in remotely controlled tail turret. The aircraft is fitted with PN-A/PN-AD bombing-navigation radar system, Argon-2 radar fire-control system and a TV-based backup optical bomb sight. The countermeasures are provided by a radar warning receiver, radio-frequency jammers, and updated defensive countermeasures gear. "The aircraft is equipped with tricycle landing gear to support operations on unprepared runways." The Tu-22M3 is powered by two Kuznetsov NK-25 turbofan engines installed in the body with large air intakes and dual exhausts. Each engine produces a maximum thrust of 25,000kg and delivers an improved fuel economy. The aircraft is equipped with tricycle landing gear to support operations on unprepared runways. The nose gear includes backward retractable twin wheels. Each main landing gear unit consists of six wheels in a 2×3 bogie arrangement. These are retracted straight in to the fuselage. The Tu-22M2 was equipped with twin brake slides and a runway arresting hook. The Tu-22M3 can fly at a maximum altitude of 14,000m and the rate of climb of the aircraft is 15m/s. The aircraft has a cruise speed of 900km/h and maximum speed of 2,300km/h. The operational range of the aircraft is 7,000km. The aircraft can be equipped with refuelling probes to allow in-flight refuelling for extended range.